Right-hander Duane Pillette is the answer to at least five baseball trivia questions: he was (1) the starting pitcher for the Browns the day 3-foot-7 Eddie Gaedel appeared as a pinch-hitter in St. Louis; (2) the starter in the final game played by the Browns in St. Louis; (3) the winning pitcher in the first victory by the modern-day Baltimore Orioles; (4) the starter in the initial home win in Orioles history; and (5) the younger half of the only father-son combination to lead the American League in losses in a season. After debuting with the New York Yankees in 1949, Pillette was traded to St. Louis the following season. The 6-foot-3, 195-pound pitcher followed the club in its move to Baltimore in 1954, and ended his major-league career with the Phillies two years later. In eight seasons in the major leagues he compiled a record of 38 wins and 66 losses, never posting a winning season. He recorded a 4.40 ERA over 904 innings in 188 games, and completed 34 of 119 starts. The Browns and Orioles never finished higher than seventh place during Duane’s years with those clubs. 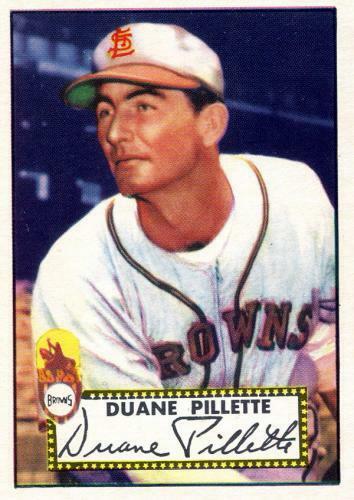 Duane Xavier Pillette was born in Detroit on July 24, 1922, the year his father, Herman Polycarp Pillette, won 19 games as a rookie pitcher with the Tigers. His mother, the former Irene Woodward, had wed Herman in 1921, and had a daughter, Verlie, from a previous marriage, who was 5 years old at Duane’s birth. Herman Pillette’s major-league pitching career peaked in 1922; the next season he tied for the most losses in the American League with 19, and departed the scene a year later with a lifetime major-league record of 34-32. The Pillette family moved around, following Dad’s baseball stops, and landed in San Diego in 1935, after the Hollywood Stars Pacific Coast League franchise was shifted to the border city. Herman had left school after the sixth grade, and wanted his son to concentrate on getting a good education. He enrolled young Duane in parochial schools and discouraged him from taking part in sports. Duane began playing baseball in junior high school, mostly at shortstop, but found his talent better suited to the pitching mound. Duane became a student-athlete at San Diego High, playing baseball with Chet Kehn, Jack Albright, and Bob Usher, all future major leaguers. In the summer of 1938 he pitched for the Post 6 Junior American Legion team, and the Sixers won the national Legion championship. The following spring, San Diego High won 20 games, lost only five, and Duane’s one-hitter beat Long Beach Wilson, 3-0, in the Southern California Interscholastic Federation championship game. San Diego didn’t participate in the interscholastic playoffs in 1940, but finished 13-1, and Duane, now called Dee by teammates and close friends, was offered a contract by Yankees scout Joe Devine, who had watched the youngster’s progress. When Devine met with Herman Pillette, he found that a college education was more important than professional baseball; he arranged for a scholarship to Santa Clara University, a Catholic school south of San Francisco. Dee was there until 1943, when he volunteered for the Naval Air Cadet program. He spent time in the South Pacific war zones, and was discharged in 1945. Dee and Patricia Daly were married in San Jose, California, on July 26, 1945; they had dated while Pillette was at Santa Clara. He spent the summer of ’45 pitching semipro ball in the Northern California towns of Scotia and Eureka, and early in 1946 signed a Yankees contract, which included a $10,000 bonus and a trip to spring training in St. Petersburg, Florida. He pitched well in Florida, and earned a ticket to Newark, one of the club’s top minor-league affiliates. Pillette hurled 194 innings for the fourth-place Bears, with 25 starts, a 3.66 ERA, and a won-lost record of 11-10. He was hampered late in the season by a groin injury that carried over for the next two campaigns. The 1947 season saw Pillette back in Newark, but in midseason he was dispatched to Portland in the Pacific Coast League to work on his curveball with the former major leaguer and veteran Beaver hurler Tommy Bridges. The Yankees preferred that he add a third pitch to complement his sinker and fastball. Dee’s combined totals with the two clubs for the year was eight victories, five defeats, and 120 innings pitched. In 1948 he remained at Portland and upped his totals to 14 wins, 11 losses, and 29 starts (189 innings). Pillette was invited back to spring workouts with the Yankees in ’49, and gained favor with new skipper Casey Stengel and pitching coach Jim Turner. Both had seen him work the previous year in the PCL. Pillette thought he might stick with the club as a fifth starter or long reliever; the four top spots were secured by Vic Raschi, Ed Lopat, Allie Reynolds, and Tommy Byrne. General manager George Weiss had other plans, however, and sent Pillette back to Newark, where he went 6-7 as a starter in 16 games. He was recalled by New York on July 18, and made his major-league debut on July 23, 1949, at Cleveland. Taking over for Allie Reynolds in the eighth inning with the Yankees leading 4-3, Pillette was touched for the tying run on extra-base hits by Larry Doby and Lou Boudreau. Jim Hegan’s homer in the bottom of the ninth tagged the rookie chucker with the 5-4 loss. At Briggs Stadium five days later, Pillette made his first major-league start, losing a 2-1 duel with the Tigers’ Art Houtteman. Pillette’s first home start came against the White Sox on July 31, when Chicago’s Luke Appling broke up a scoreless tie in the 10th inning with a two-out, two-run homer. After three losses, Pillette was credited with his initial major-league triumph on August 5, a 10-5 affair over the Browns. He was supported by Charlie Keller’s two-run homer and Yogi Berra’s grand slam. On August 15 Pillette worked in relief of Ed Lopat at Philadelphia, and took the 9-5 loss. At home to the Athletics on August 19, his four-plus innings in relief earned him the 7-4 victory over the Athletics. He ended the 1949 season with a 2-4 mark in 12 games, with a 4.34 ERA. He didn’t play in the World Series win over Brooklyn; nevertheless, the right-hander was a proud member of the world champion Yankees. Pillette opened the 1950 season with the Yankees, but was optioned to the Kansas City farm on May 15. He lost all four games he appeared in with the Blues. On June 9 he was recalled, and a week later he was traded to the St. Louis Browns, packaged with outfielder Jim Delsing, pitcher Don Johnson, infielder Snuffy Stirnweiss, and $50,000, in exchange for pitchers Tom Ferrick and Joe Ostrowski and infielder Leo Thomas. It was bittersweet for Pillette; the Yankees went on to repeat as the World Series winner in 1950, but he eventually moved into a starting role with the Browns. Pillette made his initial start for the Browns on June 29 at St. Louis, went eight innings, and was beaten by Cleveland, 4-1. He bested Chicago, 11-5, on July 8 at Sportsman’s Park for his first win as a Brownie, allowing five runs in seven innings. He made seven starts in the 1950 campaign and finished with a 3-5 record, along with a rather inflated 7.09 ERA. The 1951 season in St. Louis was entertaining, to say the least; former Cleveland Indians owner Bill Veeck bought the Browns in July, and made several moves to increase attendance at Sportsman’s Park. On July 13 Pillette hurled a four-hit shutout to vanquish Philadelphia, 5-0, and the following day Veeck signed the legendary pitcher Satchel Paige, who gave the Browns creditable service through the 1953 season. The baseball world was stunned on August 19, when midget Eddie Gaedel, wearing a Browns uniform with the fractional number 1/8 on his back, popped out of a cardboard birthday cake on the Sportsman’s Park infield between games of a doubleheader. He took a seat in the dugout and watched as Duane Pillette retired the Tigers in the top of the first inning. Left-hander Bob Cain was the Detroit starter, and was surprised, along with 18,000 fans, as Gaedel stepped to the plate to pinch-hit for leadoff hitter Frank Saucier. After Browns pilot Zack Taylor showed Gaedel’s contract to home-plate umpire Ed Hurley, Cain walked the little guy on four pitches. Gaedel ran to first base, and Jim Delsing took his place as a pinch-runner. The game was scoreless until the fourth inning, when the Tigers touched Pillette for a run, and eventually logged a 6-2 win. The loss was one of 14 he suffered in 1951, and tied him with five other hurlers for most defeats in the league. He led St. Louis in mound appearances, with 35, but won just six times. Pillette started a career-high 30 games in 1952, won 10 and lost 13, and posted a 3.59 ERA. He defeated the Tigers 2-1 on two hits on August 30, and blanked the White Sox, 8-0, on September 4. The Browns vacated the cellar and finished in seventh place. In 1953 Pillette hit the only home run of his career, a solo shot on June 27 at Philadelphia. He was 2-for-4 with the bat, knocked in two runs, and hurled a 6-1 win. Earlier, on June 16, with relief help from Paige, Pillette notched a 3-1 triumph at Yankee Stadium; the game ended an 18-game New York winning streak and a St. Louis string of 14 straight losses. On September 11 he threw a three-hitter at Fenway Park to whitewash the Red Sox, 2-0. Pilette started the final game in Browns history, on September 27, 1953. Before a sparse crowd of 3,174, he and White Sox left-hander Billy Pierce battled to a 1-1 tie until the 11th inning, when Orestes Minoso doubled home Fred Marsh for the 2-1 Chicago victory. Duane ended the season with a won-lost mark of 7-13, and the Browns capped off their stay in St. Louis with a cellar finish. Heavily in debt, Veeck sold the team to a Baltimore syndicate after the 1953 season. The Maryland city was happy to have a major-league franchise once again, even the lowly Browns. Pillette remarked that the atmosphere in Baltimore was much different; after all, the Browns had drawn only 297,000 fans in 1953, and the Orioles’ season total in ’54 was 1,060,000. Baltimore escaped the American League basement in 1954 by winning three more games than the Athletics, and Pillette set two personal career bests with a 3.12 ERA and 11 complete games. In 25 starts, his record was 10 victories and 14 defeats; nine losses were by a margin of two runs or less. Pillette had bone spurs in his right elbow as the 1955 season approached, the result of the twisting arm motion used to deliver his sinker. After five starts and a record of 0-3, the Orioles optioned him to Oakland in the PCL, where he worked 41 innings in nine games, with two wins and three losses. Baltimore gave up on him before the 1956 campaign, and the Phillies signed him. Plagued by his aching elbow, he made only 20 relief appearances, with no record, and requested his release when the season ended. Happy to be home with his growing family in California, Pillette gave baseball another shot in 1957, splitting the season between San Francisco and Seattle in the Pacific Coast League. The 34-year-old hurler posted a 16-8 mark, and went on to play three more years with a trio of PCL clubs, totaling 17 wins and 13 losses, before calling it quits in 1960. After retiring from baseball, Pillette worked in construction before embarking on a career in the mobile-home business. He helped in the building of the park in San Jose where the Pillettes later resided, and later became owner-manager of a local mobile-home dealership. When his wife, Pat, was stricken with Alzheimer’s disease, he retired from the business and was her caregiver until she died in 1999. Duane had taken up golf after his baseball career, and played until severe arthritis took its toll. He appeared from time to time at baseball reunions with former teammates and opponents, and was honored with induction into Santa Clara University’s Athletic Hall of Fame. Duane Xavier “Dee” Pillette died in San Jose on May 6, 2011. He was 88 years old, and his ashes were scattered at sea. He was survived by a daughter, Jamie; a son, Gary; and six grandchildren. In preparing this biography, the writer used clippings from the Baseball Hall of Fame, and a telephone interview with Duane Pillette on March 5, 2010. Also helpful were Encyclopedia of Minor League Baseball; The Grand Minor League, An Oral History of the Old Pacific Coast League; Retrosheet-org; Baseball-Reference.com; urbanshocker.wordpress.com; and SABR member Ray Nemec.